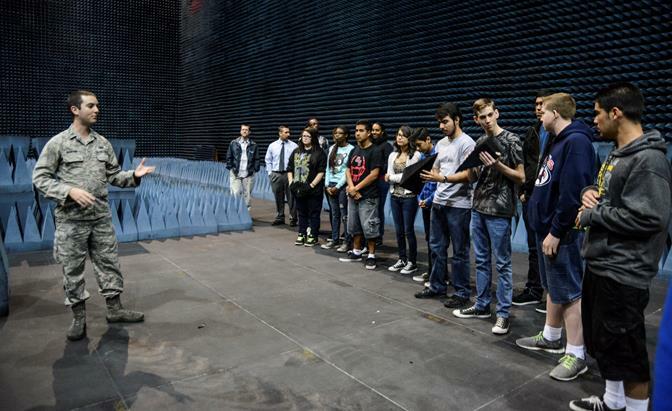 EDWARDS AFB – Students from Antelope Valley, Lancaster and Desert High Schools participated in a science, technology, engineering and math-focused tour of Edwards AFB last week. Their stops included the Air Force Test Pilot School, the 412th Electronic Warfare Group and NASA’s Dryden Flight Research Center. According to Jose Baratas, principal at Lancaster High School, they participated in the tour to stir up interest in their newly expanded engineering program. 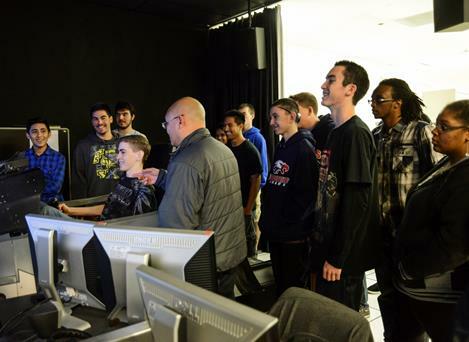 At the TPS, David Vanhoy, technical director, encouraged the students to figure out what motivates them and pursue that in their education and future careers. To support his point, he showed videos that depict a typical day at the school and what motivates test pilots to soar. 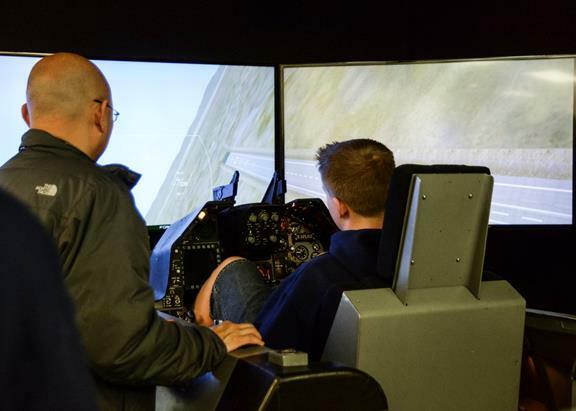 While at EWG, 1st Lt. Seth Martin, an engineer, took half of the students into the Benefield Anechoic Facility while the others went to the Integration Facility for Avionics Systems Test where they flew their F-16 simulator. “Tours like this are very important because they give people something to look forward to, with all the hard work that they are putting into their studies. I know when I was at Lancaster High School I took all the AP classes and at times you wonder, ‘why am I really doing all this, is it really worth it?’ and then you come and see something awesome like this and what I get to do on a daily basis, work with airplanes, which pretty much everyone wants to do,” said Adam Sundberg, 412th EWG, flight test engineer. Meanwhile in the BAF, Martin was answering questions about radar absorbent material and free space loss. He explained that the word anechoic literally means “without echo.” The facility is free of influences from the electromagnetic spectrum, making it a controlled space for electronic warfare tests and antenna pattern tests. The radar absorbent material, or RAM, lines the walls of the BAF and the RAM on the ground must be moved for each individual test. Once an aircraft is inside, power sources and hydro and cooling equipment are sent to the airplane to simulate flight. Tests might include checking the effectiveness of a stealth aircraft, noise jamming or false target jamming. The door to the facility is the world’s largest single-piece free standing door. The door is pushed eight inches from the chamber and then takes 45 minutes to slide open or close. Air bladders running all the way around inflate and compress the door up against the chamber to create a tight, triple-copper seal going all the way around. Then, they deflate and break the seal before a plane can be rolled in or out. “The BAF is a sterile, perfect environment and we can run test points for a lot cheaper,” said Martin. He added that they have had a variety of customers including the United Kingdom’s Tornado, NASA’s X-51 Wave Rider and the Navy’s B-22. They have also run tests on the BMW three, 5 and 7 series and even some tests for John Deer. “Transformers 2” and “Armageddon” both had scenes filmed in the BAF. “The most important thing about a tour like this is getting to see how the skills that they’re learning right now work in the real world. It’s much easier to be motivated to learn a skill when you can see how you’re going to use that in your life,” said Martin. The students weren’t the only ones who learned something new during their visit to Edwards. 3 comments for "Local students get glimpse of careers in science, technology"
Let’s continue this partnership and include more school from the east side. I wish my school was involved in this..I kinda feel bad since I’m from EHS..just because we have horrible stories about us doesn’t mean all of the students are bad.. I am happy to hear that there would be students interested from EHS. My job as future City Council Member is to worry about our Education, and create more opportunities. Thank you J.J. for your insight.